A libertarian blogger Bionic Mosquito is doing a review of The Chief Culprit: Stalin’s Grand Design to Start World War II from the pen of Viktor Suvorov, a clownish Cold War era Soviet defector who cut out a living for himself telling his Western hosts whatever he thought they would enjoy hearing about his country of birth. Since the topic covered by the book is one I know a little bit about I figure it would be appropriate to help out a libertarian blogger with his reading and offer a few corrections and explanations. Actually that is not the prevailing narrative. Immediately after the war Stalin explained the cause of early Soviet defeats in such terms. According to the Soviet dictator the Soviet Union, as well as the United States and Britain were peace loving countries and as such failed to prepare for the war to the extend Germany and Japan did. As a consequence they suffered a series of early defeats in 1940 and 1941 in France, Hong Kong, Singapore, Pearl Harbor, the Philippines and the western USSR. Such an explanation served to relativise the disaster the Soviets suffered in 1941 by placing it in the context of other rather less catastrophic and dreadful setbacks suffered by the other allied nations, and in this way deflect the blame for the horrible losses and destruction the Soviet people had sustained in the war, much of it needlessly. It was an explanation that was seemingly accepted by Murray Rothbard who in For a New Liberty spoke of an “unwarlike Stalin” who had “allowed the Russian army to fall into disrepair”. This was not accepted for long even in the Soviet Union. Instead the common wisdom after Khruschev’s rise to power presupposed an innovative and powerful pre-war Red Army on the ascent, which was prevented from effectively defending the country by the person of Stalin who first gutted it in the Great Officer Purge and then tied its hands in 1941 and left it exposed to a German surprise attack when he in the face of all facts refused to believe the German invasion was imminent. This view was also accepted by many in the West who had a somewhat favorable view of the Soviet Union or its people. Those with an unfavorable view on the other hand mostly explained the cause of German success and Soviet setbacks in 1941 in terms of Soviet or Russian inferiority vis-a-vis the Germans. Whether they played up the Soviet lack of sophistication that supposedly made the Red Army unable to make its greater numbers count against the Germans, or else the fateful interference of Stalin in a few key matters, no one actually subscribed to the idea the Red Army on the eve of war was inherently puny or in disrepair. They scarcely could have for the level of Soviet investment in their armed forces before the war was staggering and as such impossible to ignore, discount or shrug off. Indeed the Soviet defense budget rose steadily throughout the 1930s. Where it accounted for 3.4% of the national budget in 1933 and 9.1% the next year, it climbed to 16.1% in 1936, and on to fully 25.6% of the total in 1939. Pay attention to the dates of some of these events – Stalin was preparing for war up to a decade or more before Hitler attacked, at a time when the Germans were held down at least to some extent by Versailles. In fact there is nothing strange about this. The Soviet Union saw the world in binary terms. All nations were either communist or they were capitalist and thus surely dedicated to the destruction of the USSR. This view was consistent with their ideology, as well as their experience, seeing how during the Russian Civil War numerous nations had intervened militarily to try to crush the Russian Bolsheviks. Moscow perceived a threat not only from Hitler’s Germany, but from every capitalist great power without exception. It did not build up its forces to defend itself specifically from Germany, but from any possible combination of capitalist, and therefore anti-Soviet, nations. Specifically its military build-up of the 1930s was actually triggered by the expansionist posture of the Japanese. In 1931-32 the Japanese Imperial Army conquered Manchuria and therefore came in position to threaten the Soviet Far East. The Soviets were spooked and in 1932 begun arming against the Japanese, ushering in the first arms race of the interwar period. The comparison favors the Soviet T-28, in reality however, the Pz-IV was a much superior design. T-28 was a cumbersome multi-turreted tank. There is no example of this kind of a tank that would have a good combat record with any participant nation. Once the shooting started their weakness was exposed and they quickly ceased to be produced significant numbers. The Pz-IV on the other hand continued to be upgraded and produced by the Germans throughout the war. The assessment given is preposterous. Perhaps the most well-known theorist of armored warfare the German general Heinz Guderian famously said: “The engine of the Panzer is a weapon just as the main-gun.” A tank’s mobility is as crucial to the weapon’s effectiveness as is its armament and armor. This is regardless the wider strategic situation. If the initial aggressor manages to capture and hold the initiative for himself at the level of the theatre of war, the defending side may still exercise initiative by launching counter-attacks, counter-strokes and counter-offensives where the advancing enemy is most exposed. Indeed this is exactly what the Red Army was attempting to do throughout 1941. It aggressively hurled itself from one counter-stroke into another, for which the BT series of tank was theoretically very well suited. 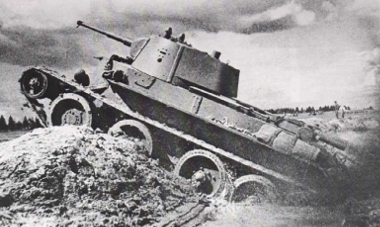 The Red Army’s counter attacks in 1941 generally ended in failure because of deficiencies in communication, supply, leadership and training, and not because once the Germans invaded the mobility of its tanks suddenly became a handicap. What is “the System”? Who are “They”? But What About Voluntary Slaves?